7240 is an all-new mould, the Kamov Ka-26. The boxart shows an Aeroflot example with the passenger module fitted and someone dangling from it on a rope ladder. 7277 is the Kamov Ka-15MG, which as predicted is the existing mould re-released with floats. It also has a large external winch attached to a sonar device. USCG HH-65A Dolphin 6540 / 67 / S, Patuxent River Test Pilot School, 1991. This is in the current all-red USCG paint scheme. AS 365N Centre d'Essais en Vol (Flight Test Centre) F-ZAGD, Bretigny, 1997. White with blue stripes & dayglo patches. To make an accurate HH-65A you will need to make a number of major changes. These include the arrangement of doors and windows on both sides, enlarging the diameter of the fenestron and decreasing the number of blades from 13 to 11, modifying the tail skid, adding a winch, etc, etc. Model Alliance make an alternative set of decals for the all-red USCG scheme, and also a set for the earlier red and white scheme. 3. Fujimi will soon be releasing another limited edition of their KV-107, #72130. This time it's a JASDF base (Hyakuri Rescue 40th Anniversary), so it'll be the KV-107/II-5 with big auxilliary tanks. Also from Fujimi comes another variant of their Black Hawk, #72131 is a JGSDF UH-60JA. #32004. XM-23 M-60D weapons set for the Revell UH-1D/H. This 12 piece resin kit includes 2x M-60D guns, 2x spent shell bags, handle mounts, 2x pintle posts, right and left ammo cans with optional can top or open belt ammo, and right and left helicopter supports. #35003. MH-6J Little Bird conversion set for the DML/Dragon AH-6J #3527 or MD500 Defender #3525. This 39-piece resin kit includes complete cockpit upgrade with optional seats, FLIR head and mount, APR-39 sensors, Doppler antennae and new Light Weight Plank system. 6. Continuing their re-issue of former MRC kits, Academy have re-issued the 1:35 AH-1T+ 'Gold' SuperCobra as kit #2198. 7. Several US vendors are offering a 'new' 1:72 Mil Mi-4 Hound from Toga. These kits, which come with either floats or wheels, are not actually new, having previously appeared under various labels such as ZTS, AER, Unda, etc. Don't let this put you off though, they are nice kits. 8. Unicraft have released a 1:72 Focke VTOL 'Luftwaffe '46' kit which might qualify as a rotorcraft to the very broad-minded. 9. Azimut Productions from France, producers of many 1:35 figure sets, are intending to release a US Helicopter Crew suitable for the Huey, Cobra, Apache, etc. 10. Here are the options on the Model Alliance #CAF-72003 Canadian Kiowa 'D-day' anniversary schemes decal sheet. The artwork for the DHFS Squirrel HT.1 decal sheet #UK-72031 shows ZJ265 / '65', which wears the standard gloss black & yellow scheme. 11. 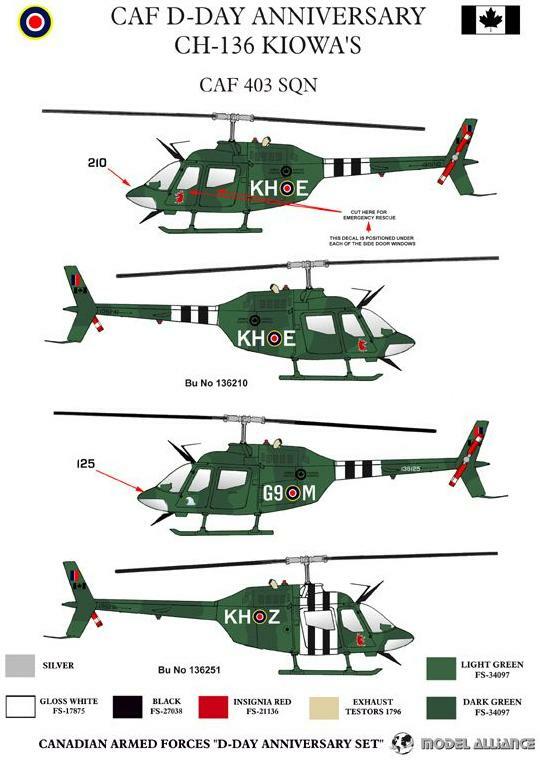 Daco have produced a set of Belgian Army decals for the Agusta A109. Daco say that "It's only available as inclusion with the Revell kit, and won't be sold seperately. At this moment only about 100 boxes are available in several Belgian shops, and it will be a while before more will become available". 12. Of interest to Stateside HKN readers, Linden Hill are now stocking Model Art Decals. They only list three selections as of now, but promise to increase their range in the near future. 13. Squadron/Signal will probably be printing a new Walk-Around volume in a few months time. This one will be for the AH-1 Cobra. 14. The new Cutting Edge 'poseable' seatbelt sets (HKN #138) are made of rubber. Thanks to Gary Madgwick (Model Alliance), Howard Dishman, Tony Morgan, Tim Vereecke, Danny Coremans (Daco), and Chris Miller (Cobra).